Six weeks, as many of you will now be realising, is a long time to fill – and keeping the kids busy can often be a struggle. If you don’t have the finances available to go out every day, or you’d rather avoid the hassle, then you’ll be happy to learn that keeping the kids entertained at home is pretty simple. Provided, of course, that you’re in tune with their interests. Let’s take a look at a few activities for the six weeks’ holiday, and see which might make the best match for your family! When you’re a kid, reading can be fantastic fun. With the help of a good book, you can absorb yourself in another world – and perhaps learn something in the process. If you’ve got a reader in the house, then keep them quiet with a novel or two. 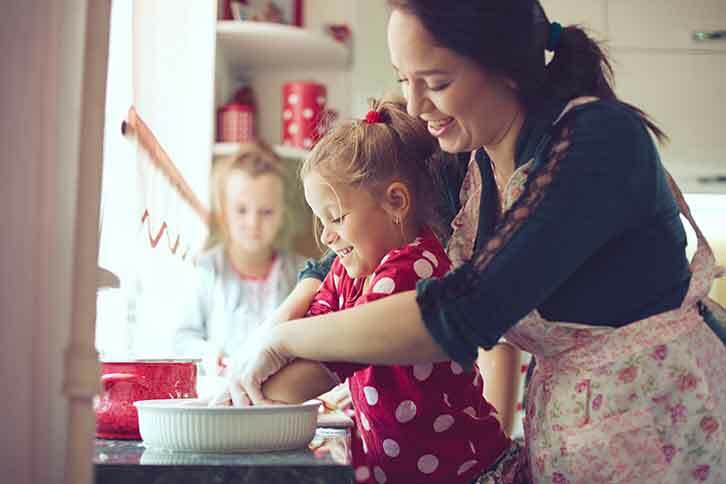 Baking is an easy way to teach the kids about cookery, and thereby set up habits that’ll keep them healthy for life. While searing a steak on an open flame might be dangerous, putting a trayful of miniature cakes into an oven is pretty straightforward. And they’re sure to relish licking the bowl clean after you’re done! If you’re stuck for ideas on what to bake, there are a whole host of baking videos for kids; that you and your family can get stuck into! A picnic on a summer’s day is among life’s simplest pleasures. Pack a hamper full of jams, cheese and a diverse selection of sandwiches. Get the kids involved in the preparation, and allow them to help devise the menu. You can even throw in some of the miniature cakes you’ve baked! Not sure where to picnic? National Parks has a list of the top 15 secrets best locations where you can put your blanket down to enjoy a sandwich, and a flask of tea – some of them may be closer than you think. Exercise is a fantastic habit to get into, and there are few forms of exercise better than a bracing stroll through some green and pleasant land. Britain’s woodlands are packed with things that will amaze the kids. The best-kept of them will even include special kid-friendly attractions like adventure playgrounds. Going to the woods is the first step, but what do you do when you get there? Build a den? Make a mud pie? The National Trust has loads of suggestions that won’t cost you anything either. Pitch up a tent in the garden, and you’ll expose the kids to the great outdoors without having to take them far from home. If they’re a bit older you’ll be able to leave them in the tent overnight, or you can come and bring them in when you decide to go to bed yourself. A better idea, however, is to join in with the camping yourself. The temperatures are warm enough to make a stay in a tent comfortable, and you’ll be able to do a bit of stargazing if the weather’s favourable. Don’t have a tent? Luckily for you, camping isn’t for everyone – so rather than forking out for a new one, why not pick up a second-hand tent on eBay? While the season for egg-hunts might have been and gone, you might still arrange a treasure-hunt in the garden (or even the local neighbourhood). Just be sure that you don’t hide any of the secrets anywhere awkward or dangerous, and supervise everyone throughout. Not sure where to start? Don’t worry, there are guides available to help make planning the best treasure hunt a breeze! Children have been dressing up for generations – and they won’t need any instruction. Just fill a box full of old clothes and allow them to get on with it. If you don’t have a collection of outfits readily available, plenty of charity shops like Oxfam and Barnardos will have the perfect wardrobe for any fashionista, and only for a few pounds too! Be sure to capture the evidence on film so that you can play it on a big screen when they get married! Whether your child is into painting, drawing or sculpting, you’ll want to provide them with the time and space to pursue the hobby. Encourage their creativity, but set them a few boundaries and ground-rules. You don’t want paint spattered across your carpet, after all. If they’re a little older, they might have a big project in mind: you can lend a hand wielding power-tools and other equipment they’re not able to deal with yet. You’re probably within driving distance of a decent miniature golf course. But even if you’d rather not spend the money, you can replicate the experience in your garden using a combination of drainpipes, shoeboxes and angled bowls. You only need come up with one hole, which you can rearrange after every round. The possibilities are endless! Now that the recent spell of obnoxiously warm weather is just about over, we might safely break out the hose pipes again. This means plenty of opportunity for outdoor fun. Chase the kids around the garden with a hose-pipe, fill a paddling pool, or equip them with water-balloons and enjoy the resulting chaos. Just be sure you don’t bring the water indoors! There are hundreds of different museums across the country, and many of them are free to enter. With special exhibits cropping up throughout summer, your local museum makes an ideal destination for an educational trip. Present the kids with a choice of different museums, and make a day of it.